Certified by the Organization of Control and Certification of Organic Products since 1994. A combination of taste and smell of the fresh fruit that has been carefully harvested at the best stage of maturation. The fruity aroma is immediately recognizable by both smelling and tasting the oil. A characteristic flavor coming from green olives or olives that have just started changing color. It can be particularly pleasant depending on its intensity. A characteristic flavor of olive oils produced at the beginning of the olive cultivation period mostly from green olives that are still underripe. The pungent flavor is generally considered an advantage that elevates the experience of tasting. 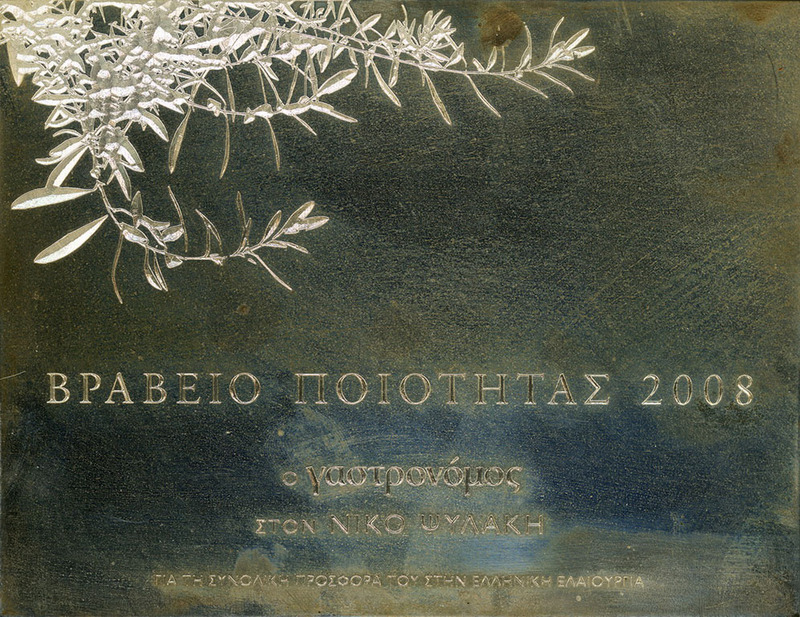 The Koroneiki olive cultivar, which is also known as Kritikia, Koronia, Koroni, Ladolia, Lianolia, Psilolia, Vatsiki, Asprolia among many other names, is spread across the geographic regions of Greece. More specifically, it is cultivated in Messinia, Ilia, Zakynthos, Laconia, Achaia, Aetolia-Acarnania, Kefalonia, Samos, the Cyclades and Crete. It is a very important cultivar, because it is very productive and can withstand the climate of the dry and warm areas of Greece. Its requirements with regard to soil, humidity and care are rather low and the trees of this cultivar can be cultivated at an altitude of up to 500 m.
This cultivar has a steady bearing and a relatively high yield ranging from 30 to 100kg of fruit per tree. It can even reach 150kg of fruit per tree in favorable climatic conditions. In adverse conditions, the phenomenon of biennial bearing is particularly intense for this cultivar, but it can be contained in irrigated areas through proper pruning and care. It is an early cultivar, as it blossoms in mid-April and its fruit ripens from early September to late December. The Koroneiki cultivar is one of the olive oil-producing cultivars. More specifically, the olive oil content of the fruit is high ranging from 15 to 27%. The oil of the Koroneiki cultivar is fine and has an excellent aroma and taste. Its main disadvantage is the small size of its fruit that makes machine harvesting difficult. Morphological properties: The trees of the Koroneiki cultivar reach a height of 5 to 7 meters, but sometimes they can get up to 15 meters high. Their foliage has a hemispherical or cuplike shape. The leaves of this cultivar are lanceolate, dark green and small with a length of 5.45cm (±0.52cm) and a width of 1.03cm (±0.12cm). The fruit has a cylindrical / conical shape with an average weight of 1.3g and a small papilla. The fruit color is green at first and then it starts to fade to become dark or purple in the end. The core has a similar shape to the fruit and a curved side. The ratio of pulp to the core of the fruit is 3.8:1. This cultivar is very common in the prefecture of Rethymno. It is susceptible to the olive fruit fly (Bactrocera oleae), the cottony cushion scale (Euphyllura olivine) and the golden green snout weevil (Rhynchitescribripennis). The Tsounati cultivar is also known as Matsolia, Mastolia, Mouratolia and Mastoeidis. It is mainly cultivated at the prefectures of Laconia, Arcadia (Megalopoli area), Messinia (upper Messinia), Rethymno and Chania. This cultivar can withstand cold and can be cultivated at an altitude of up to 1,000 m. It thrives on calcareous soils, but also yields well both on rich soils and on soils of medium texture. The Tsounati cultivar is one of the olive oil-producing cultivars. The olive oil content of the fruit can reach up to 25% and it is of very good quality. Morphological properties: The trees of this cultivar reach a height of 6 to 8 meters. Their trunks have a large diameter and the shape of their foliage is irregular. Their leaves are light green or gray-green with a trench along their central vein ending up at a little spine. Furthermore, the leaves are medium-sized with a length of 6.18cm (±0.67cm) and a width of 1.18cm (±0.13cm). The fruits of this cultivar are individual, oval, medium-sized and deep purple in color and have an average weight of 2.6g. They always end at a mastoid outgrowth with a characteristic papilla. Their core has a similar shape, i.e. oval to cylindrical / conical and an average weight of 0.37g. The ratio of pulp to the core of the fruit is 6:1. The Tsounati cultivar is particularly susceptible to the olive fruit fly (Bactrocera oleae). Olive harvest and oil production at the organic olive grove of Teresa Psyllaki. The Koroneiki, which is mainly common on Crete, the Peloponnese and the Cyclades, due to its fruitfulness, its yield and its durability. The oil of this cultivar is fine and has an excellent taste. 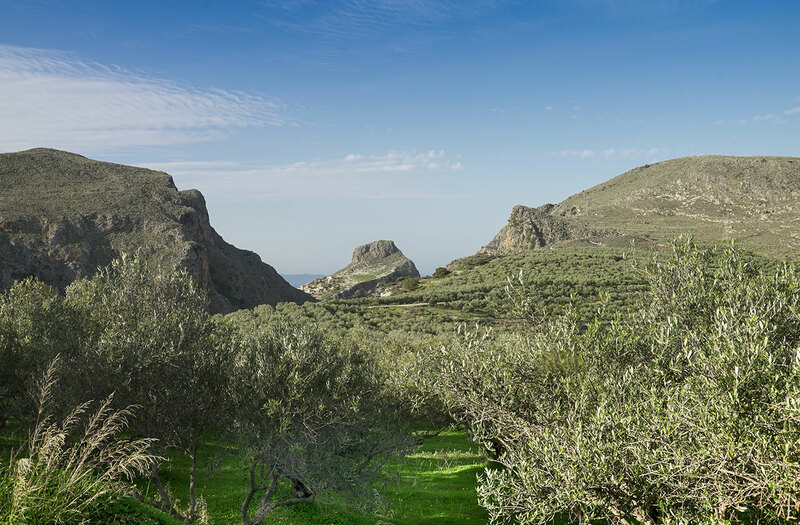 The Tsounati, which is rarer and more ancient and is cultivated in higher altitudes offering very good yields and an olive oil of particular taste. Only fertilizers of organic origin that respect the biodiversity of the area are used to fertilize the trees. Their rational use is based on a fertilizing and soil analysis plan. 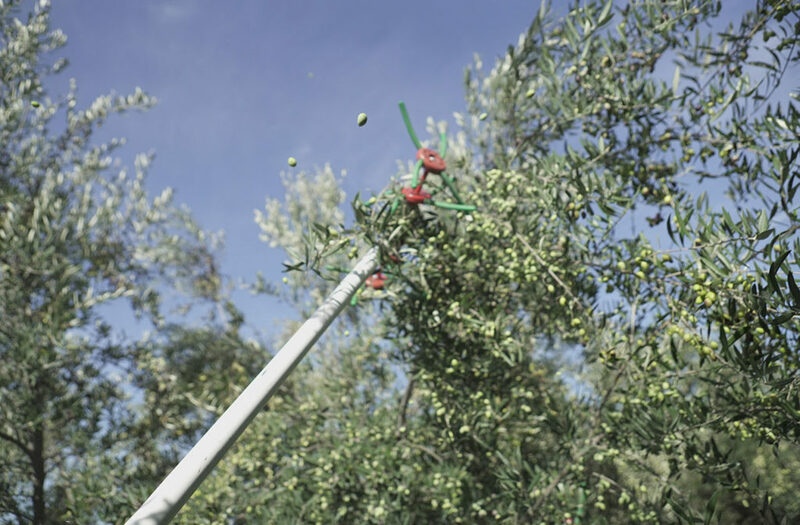 The olives are harvested by workers, who spread out nets under the trees and start hitting the short olive trees using special combs. Apart from vibrating rods, no other harvest tools are used, in order to avoid causing unnoticeable injuries to the leaves, buds and tender sprouts. 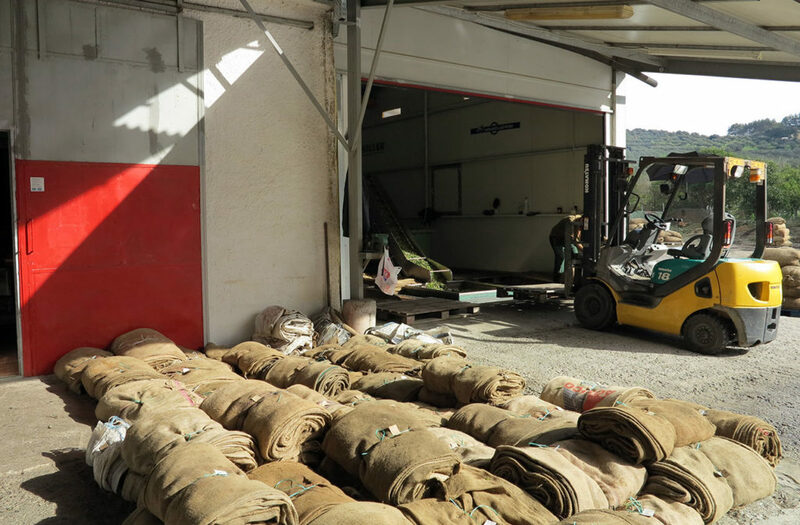 The olives are transported immediately to the oil mill in order to avoid damaging the fruit and to prevent the rapid development of “enzymatic processes” that oxidize it. Preserving the good quality of the fruit is of particular importance for the final quality of the olive oil. 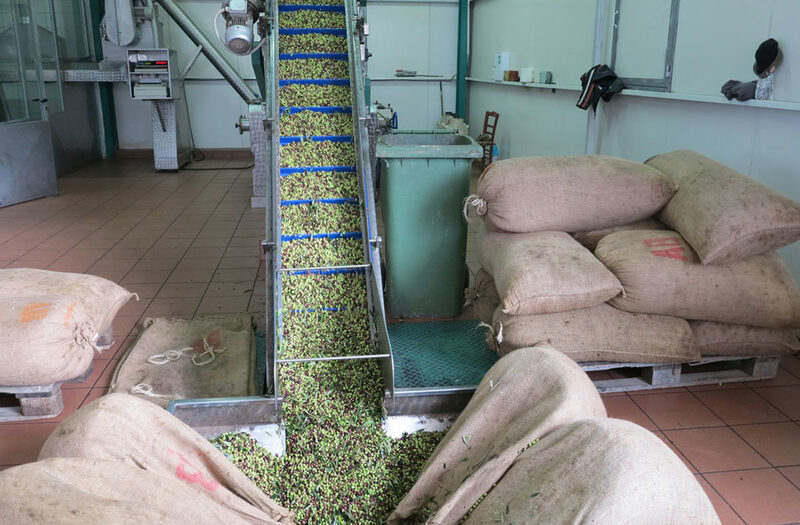 The olive crushing process is specific and demanding, because the product is organic. Therefore, the spaces and machinery need to be cleaned thoroughly. The water temperature during the olive oil extraction process must not exceed 28°C. It is an athermic cold pressing process. 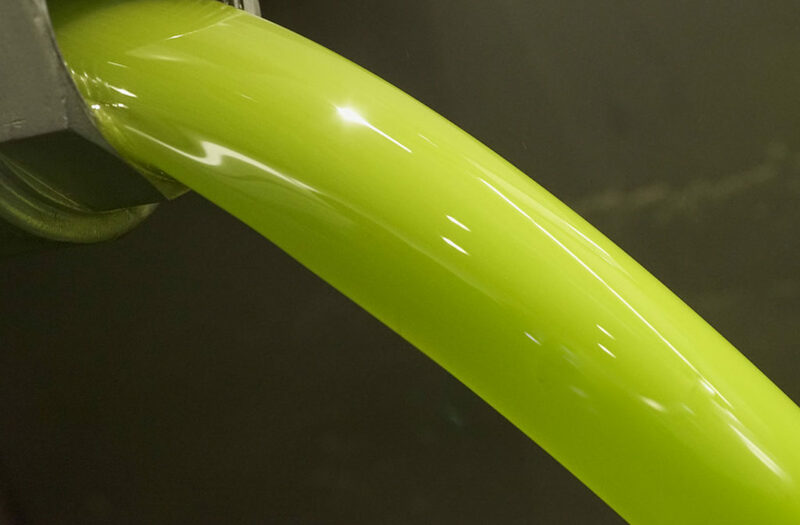 Through this process, the olive oil retains its ingredients unspoiled to a large extent. Those ingredients, such as antioxidants and Vitamin E, that are invaluable to human health, make the oil special and play a role in its flavor. 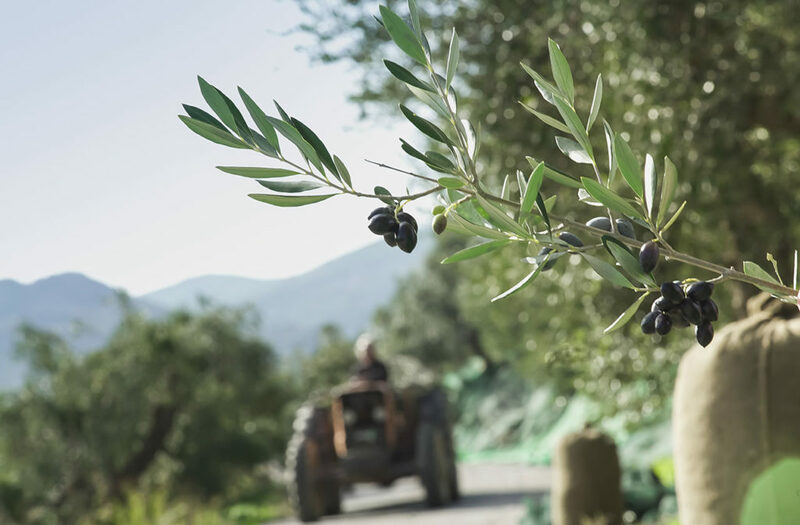 Every single drop of the Ktima Teresa Psyllaki extra virgin olive oil contains all of the care and attention that accompanies its special production process, when it reaches your table. The olive oil is transported to a separate dark and cool storage space and it is stored in stainless containers in order to be preserved unspoiled. After filtering out any remaining small fruit parts and sediment, the olive oil is immediately bottled in special metallic containers in order to better preserve its quality and have it ready for transport. 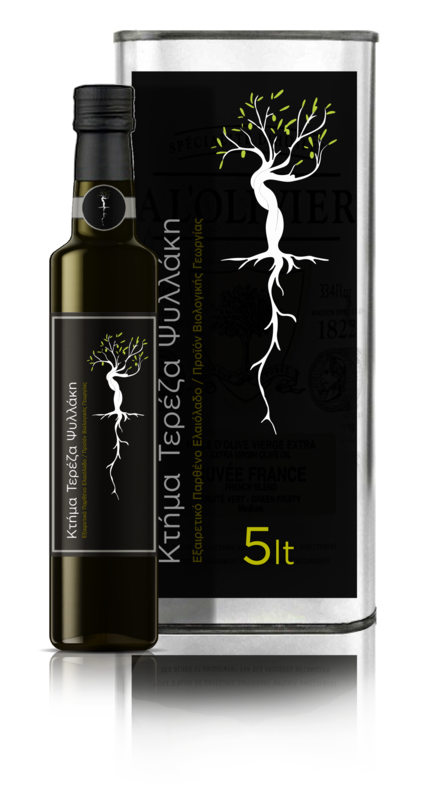 The high quality “Ktima Teresa Psyllaki” extra virgin olive oil, PDO, is an organic product and it has been certified by the Organization of Control and Certification of Organic Products since 1994. 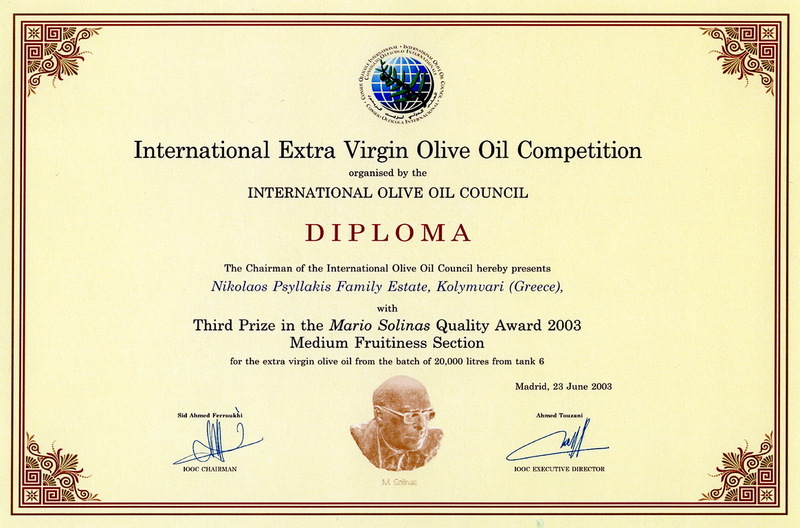 In 2003, it won the 3rd international MARIO SOLINAS Quality Award of the IOC (International Olive Council). In the same year (2003), it won the 2nd award at the Great Taste London competition in the UK under the trade name Biojoy. It also won a distinction under the trade name Biojoy at the International Olive Oil Quality Competition that took place at the China Oil Fair in 2008 in Shanghai. In the same year, it was selected by the Organization of Control and Certification of Organic Products in order to participate under the trade name Biojoy in an international organic olive oil production event (the greatest of its kind) in Italy. 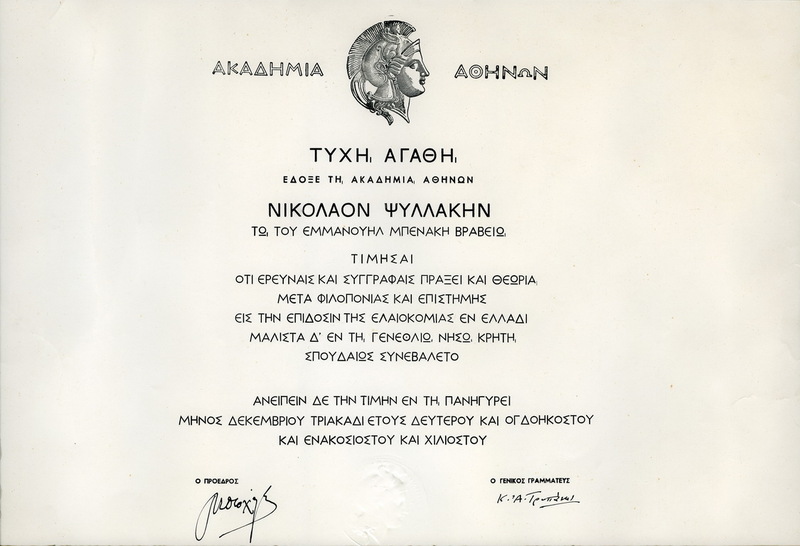 In 2008, it was awarded an Honorary Quality Award by the Gastronomos magazine of the Kathimerini newspaper.